Update: The rush line was entertaining (an altercation between the older ladies and an Italian tourist who attempted to jump ahead in the line) and the time went by fairly quickly. You can't beat a $20 orchestra seat. We met up at the Old Stand By and then headed in. It was a nice change to not rush up to the Family Circle. I still stand by my previous statements that while its infinitely more comfortable to sit in the orchestra, the sound is far more rewarding at the top of the house. Although the score dragged and was a bit repetitive, it was beautiful and was well sung by all. Irwin Schrott was every bit as cute as I expected him to be...the moment he poured wine over his open white silk shirt just about did me in and he can sing too! Schrott played Giovanni as the bad boy you love instead of hate. I loved Ildar Abdrazakov as Leporello. Sally and I went backstage a couple of seasons ago to greet Violetta Urmana after Gioconda and Ildar was back with his wife Olga Borodina. We also heard him and Olga sing "Viva, viva...Oh che muso" at the Volpe Gala. Anyway, he is just too cute and funny. I always adore the baritones. Matthew Polenzani was a fine tenor and his presence is nice. 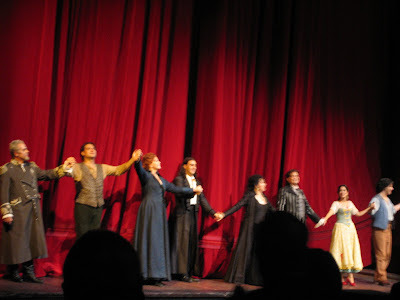 Soprano Krassimira Stoyanova sang nicely but her curtain call was the best - it was high drama with a flourishing cross between Angela Georghiu's and Patti LuPone's Diva Bows. Replacement Zerlina Monica Yunus was fine in her debut and I thought adequate. She seemed uncomfortable in her shoes but did a fine job. Obviously, Susan Graham was there to win the night for me. She had the largest voice of this cast. She took all of the comedy moments and ran with them. 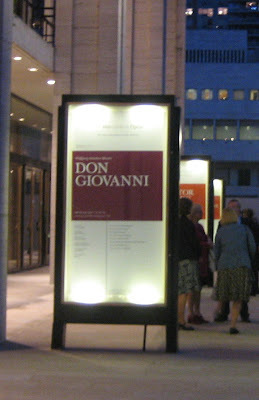 It's a longer opera than it needs to be, but it was fun. After, we had the green room to ourselves. Some of our party saw Mrs. Schrott go by, wrapped in a fur, but baby Schrott must have been with the nanny. Diana Damrau was also back visiting. Susan had us in stitches by regaling us with stories of the Gala Opening Night. She said they are trying to do Iphigenie at the WNO with Placido, if they can nail down his schedule. Thankfully, Sally and I will see her again in a couple of weeks at the Tucker Gala. OH!!! Look at you hot stuff!!!!!!! You're not the first to raise the question about whether or not the Family Circle audience is better than orchestra. I say it is definitely and infinitely better...most of the time. Wasn't Susan the best...so funny!